The Golden Circle is the quintessential Icelandic tour and covers three of the most famous attractions in Iceland. Geysir, a world famous erupting geothermal hot spring. Gullfoss, one of Icelands most magnificent waterfalls and the historic Þingvellir National Park. You will spend about 45 to 60 minutes at each stop giving plenty of time to take photos and enjoy the view. Golden circle tours can usually be booked online with short notice and in most cases even on the same day. The Golden Circle is an unmissable day tour for anyone visiting Iceland. 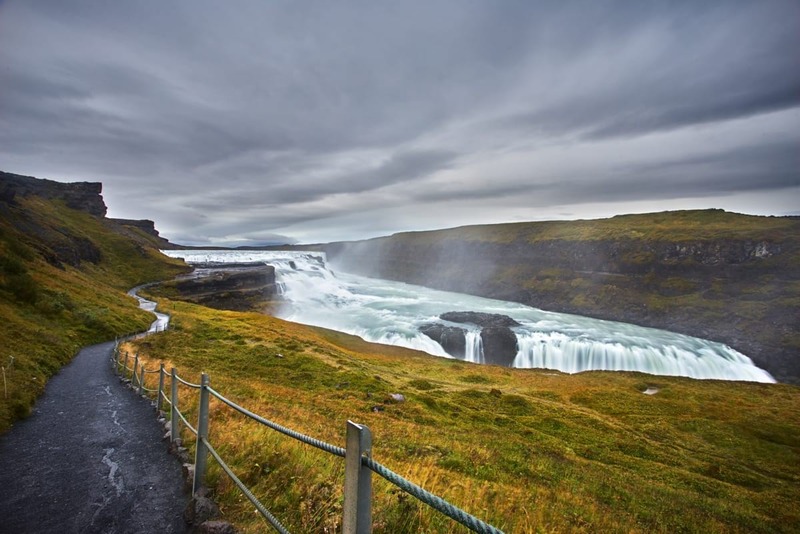 Grand version of the Golden circle where you see the world famous erupting geyser & hot springs, experience the magnificent Gullfoss waterfall, walk down the lava canyon in Þingvellir national park and visit Kerið the volcanic crater. See Icelands most famous sights Gullfoss, Geysir and Þingvellir National Park. Visit Friðheimar cultivation centre where vegetables are grown with geothermal heat. Join us for an unforgettable expedition with a small group. We visit the famous Thingvellir National Park, Gullfoss waterfall, Geysir and the geothermal area. See Kerið volcanic crater and an Icelandic traditional farm to pet some horses. 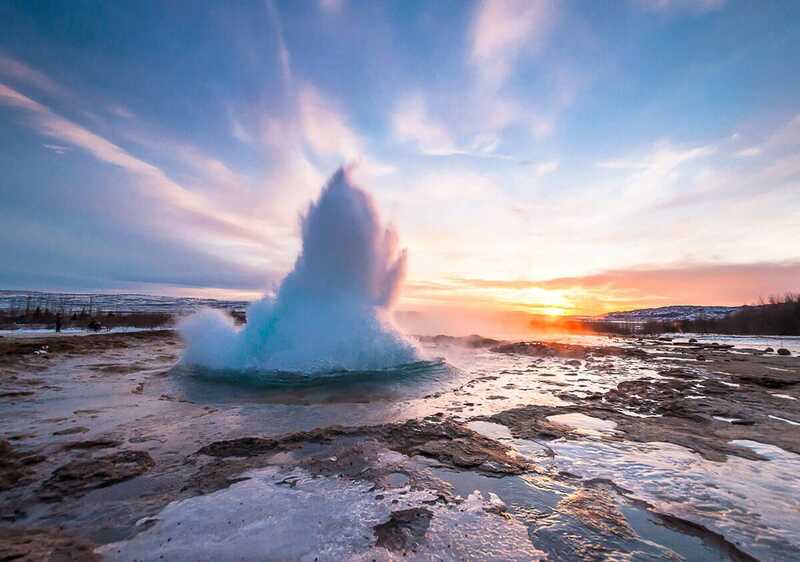 Geysir is the name commonly given to the geothermal area which houses the "Great Geysir". This magnificent geyser is one of the first of its kind to ever be mentioned in print and as such is where the english word 'Geyser' originates from. While the Great Geysir is no longer able to errupt without assistance her sister geyser Strokkur erupts every 6-10 minutes and shoots hot water 20 meters (70 feet) up in the air. This natural phenomenon and display of volcanic power is truly amazing. Seeing a geyser erupt a sight that can't be missed for anyone visiting Iceland. The geysers are actually in an area called Haukadalur about 1 hour and 30 minutes from Reykjavik. You will surely know when you are there as you will quickly see steam rising from the ground. Many hotsprings and hot rivers are located in the area. Be careful to not step in the hot water when walking around but don't worry too much as they are clearly marked. In the area you will also find a visitor center with all the important facilities. Food can be bought at Hótel Geysir and the Glíma restaurant & coffeeshop. At the Geysir store you can buy souvenirs, designer Icelandic clothing and more. Gullfoss (which translates to the Golden falls) is one of Icelands largest and most majestic waterfalls. Gullfoss is located about 1.5 hours away from Reykjavik. The waterfall is fed by the mighty Hvítá river which originates in the Langjökull glacier and gets it's name from the gold hue it gives off as it tumbles downward into the canyon. This shimmering seems magical at first but it simply a product of the unique mineral composition of the water. As mentioned the waterfall is a part of Hvítá river (or the white river) and drops down into a crevice of 32 meters (105 ft) in two steps being 11 meters and 21 meters each. It is not entirely uncommon to be able to see rainbows can be observed dancing across the top of the cascade as the water vapour catches the sunlight. Gullfoss also has a number of interesting legends and stories surrounding it, one such story talks of foreign investors wanting to use gullfoss to generate power. While their venture ultimately ran out of money to continue many attribute the preservation of the waterfall to a young girl by the name of Sigríður Tómasdóttir who protested tirelessly to make people realise how precious the waterfall was. She even went to far as to threaten to throw herself into the waters but thnakfully the waterfall ended up being owned by the state who gave it a protected status. While we may never know if Sigriður was real or not a plaque stands in her honor at Gullfoss. From the lower deck you can walk a path that leads towards the first plunge of the waterfall. This will give you a great view into the crevice and a feeling of the true power of the waterfall. This path can be closed if conditions are considered too risky. Þingvellir National Park (Thingvellir) is potentially Icelands most historically significant site. This is where the worlds first parliament was established by the vikings in 930 AD, the parliament later moved to Reykjavik but this was not until 184f. Thingvellir was eventually designated as a world heritage site in 2004. Þingvellir is located close to Reykjavik, only about 40 minutes drive away. As you walk down towards the valley you can read interesting tidbits about our history, viking era and how the laws of the land were establisted at Lögberg a great scenic point. 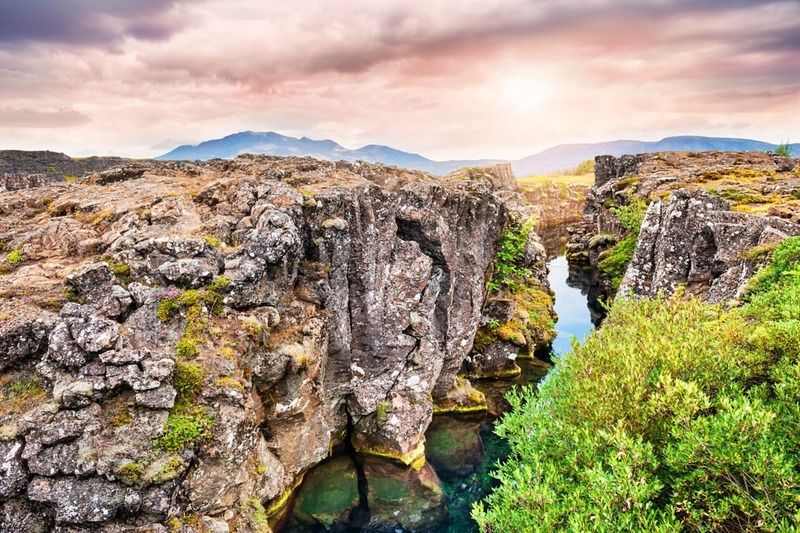 Þingvellir is also a popular spot for snorkling and diving as the crystal clear fissures of Silfra offer a once in lifetime experience. 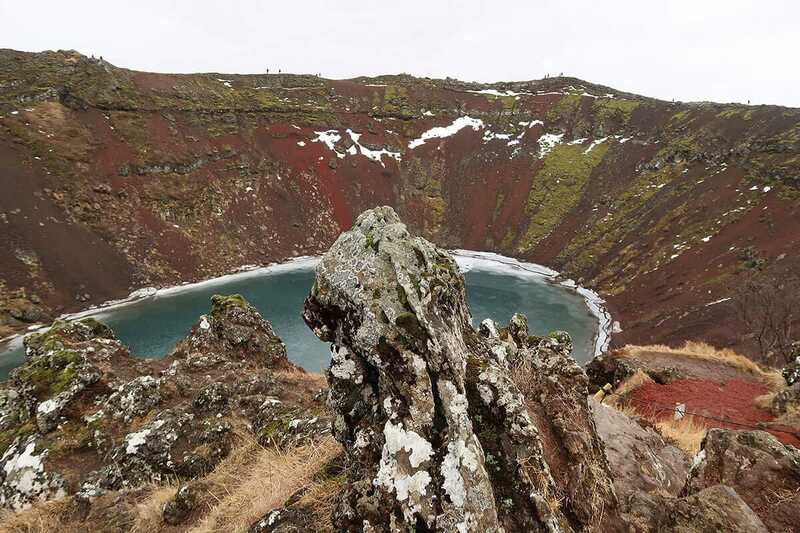 Kerið is a volcanic crater that is often visited as an addition on the Golden Circle tour. The Kerið caldera was formed 3000 years ago and is about 55m deep (180 ft) and 270m wide (890ft). You can walk around it or venture down to it. At the bottom you will find a small lake with a vivid aquamarine blue despite it's shallow depth. Kerið is a beautiful sight and a great addition to the Golden Circle if time allows. The express and combo tours don't always have time to stop at this sight but some of the grander excursions do. It was once believed that Kerið was a volcanic crater created after a large explosion but study of the area showed no evidence of any explosions of the required magnitude had occurred here. Current theories state that Kerið was in fact itself a volcano that emptied its magma reserves and collapsed in on itself. The Golden Circle is a 300 KM route that departs from Reykjavik and makes stops at Þingvellir, Geysir and Gullfoss. All stops include a visitor center where you can grab snacks, get souvenirs and use the facilities. Extra stops can be made at Kerið crater, the secret lagoon, or at local farms where guests can interact with the Icelandic horse and taste some of the local produce. Guided day tours to the Golden circle take about 6 to 8 hours depending on the stops. At each stop you will spend up to 60 minutes. If activities such as snowmobiling, glacier excursions or hot spring bathing is added the trip will extend to 10-12 hours. Tours are offered in a regular coach, mini bus, SUV and super jeep both as a part of a group or as private tours. All tours offer pickup from major hotels and guesthouses in Reykjavik as well as the designated bus stops downtown. Some tours offer to pickup in neighbouring townships such as Kópavogur, Garðabær, Seltjarnarnes, Hafnarfjörður and Mosfellsbær. A few tours also start in Reykjanesbær near the Keflavík airport. All private tours offer pickup from custom locations including airbnb's and hotels in the countryside. A small additional fee might be applied based on the location.